The EHG® SL10 is a key component in a powerful system heating element control that integrates a heater, an adjustable set point temperature controller, high/low temperature alert, power switching device and a high temperature safety limit. 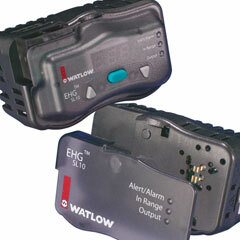 This agency recognized controller/safety limit meets UL® 1998 and CE 60730 requirements. The optional display/communications module can be easily upgraded and added in the field to provide digital display indication, adjustment of set point, RS485 Modbus® communications and other human machine interface (HMI) features. This system allows you to purchase only what is needed for your application. The easy to install, compact design, inherent reliability and integrated limit functions make this heating element controller a tremendous value. The controller is designed for easy integration with Watlow® heaters simplifying engineering, reducing component count on new equipment and decreasing cost of ownership. For original equipment manufacturers (OEMs), CE, Semi-S2 compliance and UL® recognition will reduce time and costs necessary for global agency testing and validation.